5827 ⊙ 9IVg 1 / 2 P. With overprint \"bermuda\" with two-sided gutter extension, neat cancelled, photo expertize Pieles BPP. 5828 ⊙ 9IVh 1 / 2 P. With overprint \"Hong Kong\", neat cancelled, photo expertize Pieles BPP. 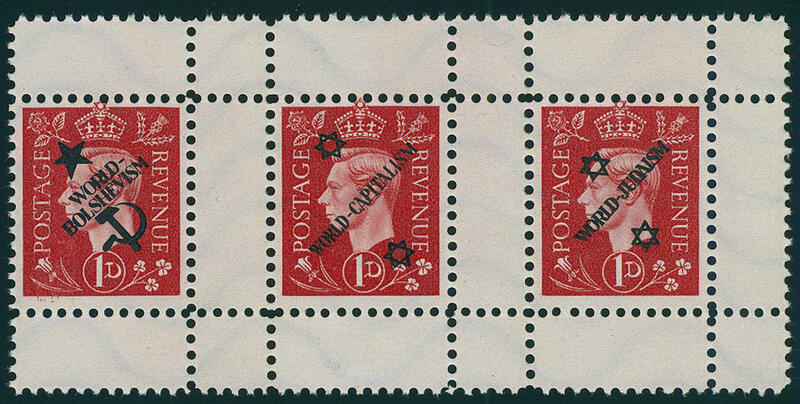 5829 10IIa,b,c 1 P. King George VI, German Propaganda forgery for Great Britain, horizontal strip of three with gutters and tripartite gutter extensions with the inscriptions \"WORLD BOLSHEVISM\", \"WORLD-CAPITALISM\" and \"WORLD JUDAISM\", wonderful fresh colors, unfolded in utterly perfect condition, as issued on ungummed paper. 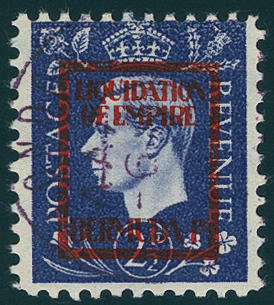 The edition this stamps amounted to be on in each case only approximate 30 piece, so that such se-tanant stripe are extremely rare! Photo expertize \"the quality is perfect\" Pieles BPP. 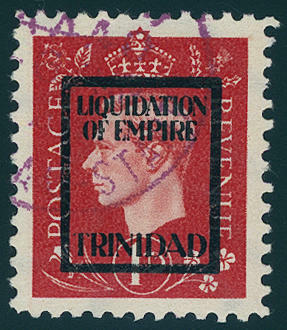 5830 ⊙ 10IVc 1 P. With overprint \"TRINIDAD\", neat cancelled, photo expertize Pieles BPP. 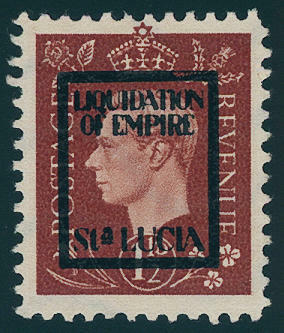 5831 11IVb 1 ½ P. With overprint \"ST. Lucy\", in perfect condition mint never hinged, as issued without gum. Photo expertize Pieles BPP. 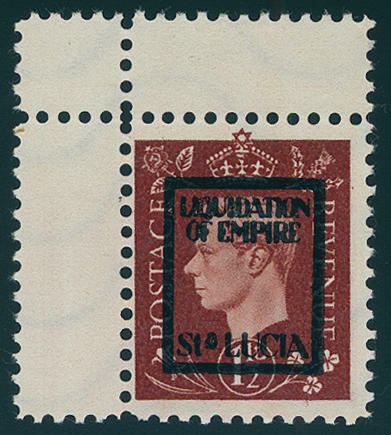 5832 11IVb 1 ½ P. With overprint \"ST. Lucy\", with two-sided adhesive gutters, in perfect condition mint never hinged, as issued without gum. Photo expertize Pieles BPP. 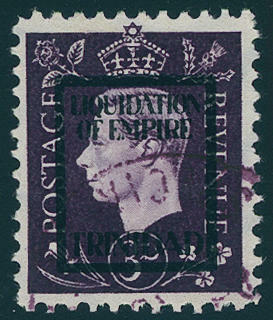 5833 11IVe 1 ½ P. With overprint \"TRINIDAD\", in perfect condition mint never hinged, as issued without gum, photo expertize Pieles BPP. 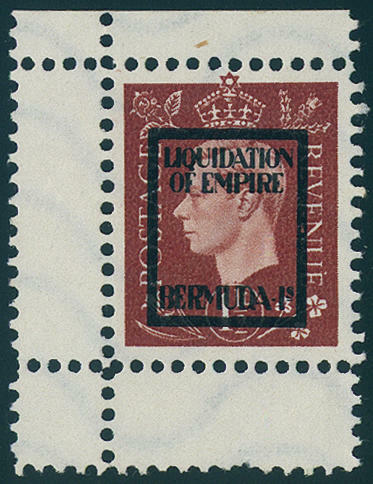 5834 11IVg 1 ½ P. With overprint \"bermuda\", two-sided with gutter extensions, in perfect condition mint never hinged, as issued without gum, photo expertize Pieles BPP. 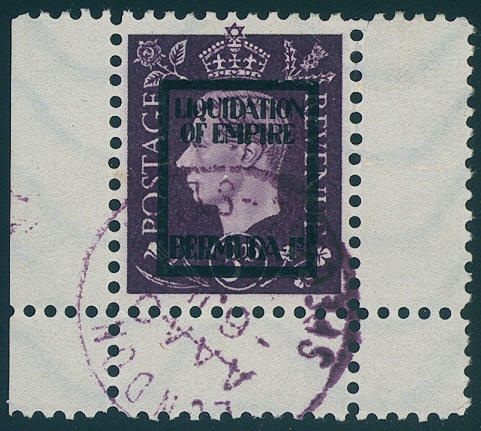 5835 ⊙ 11IVg 1 ½ P. With overprint \"BERMUDA-IS\" with two-sided gutter extension, neat cancelled, photo expertize Pieles BPP. 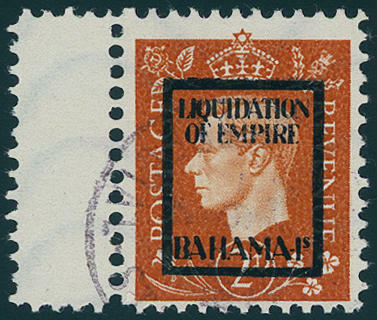 5836 ⊙ 12IVf 2 P. With overprint \"BAHAMA-IS\" with gutter extension, neat cancelled, photo expertize Pieles BPP. 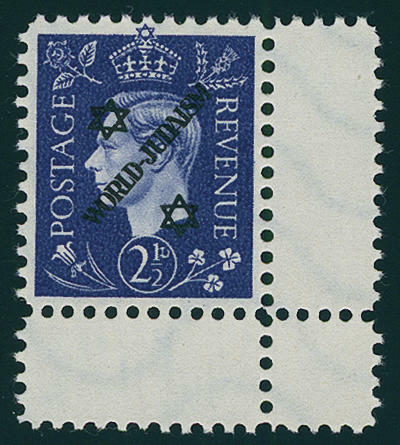 5837 13IIc 2 ½ P. King George VI, German Propaganda forgery for Great Britain, with scarce overprint \"WORLD-JUDAISM\" with two-sided gutter extension, fresh colors and in perfect condition unused, as issued on ungummed paper. 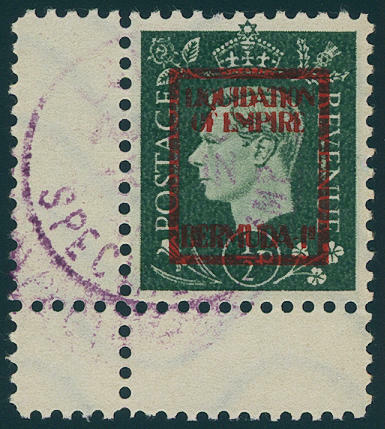 Issued only approximate 30 piece and by Michel fully undervalued! Photo expertize \"the quality is perfect\" Pieles BPP. 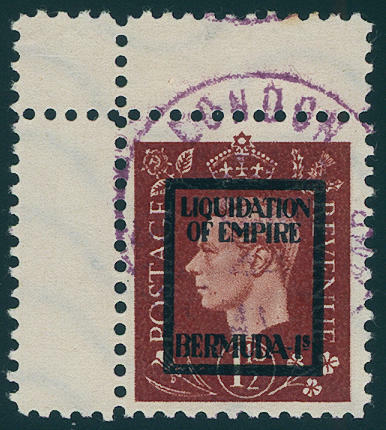 5838 ⊙ 13IVg 2 ½ P. With overprint \"bermuda\", neat cancelled, photo expertize Pieles BPP. 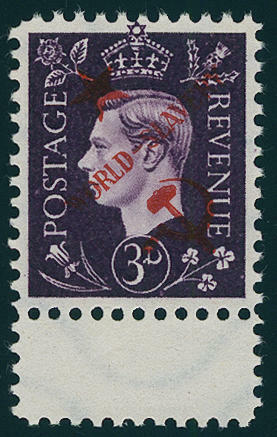 5839 14IIa 3 P. King George VI, German Propaganda forgery for Great Britain, with scarce overprint \"WORLD-BOLSHEVISM\", with two-sided gutter extension, fresh colors and in perfect condition unused, as issued on ungummed paper. Issued only approximate 30 piece and by Michel fully undervalued! Photo expertize \"the quality is perfect\" Pieles BPP. 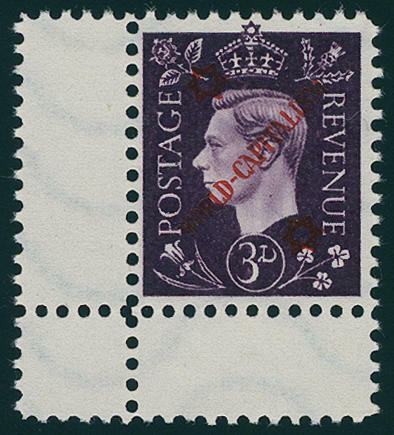 5840 14IIb 3 P. King George VI, German Propaganda forgery for Great Britain, with scarce overprint \"WORLD-CAPITALISM\" with two-sided gutter extension, fresh colors and in perfect condition unused, as issued on ungummed paper. Issued only approximate 30 piece and by Michel fully undervalued! Photo expertize \"the quality is perfect\" Pieles BPP. 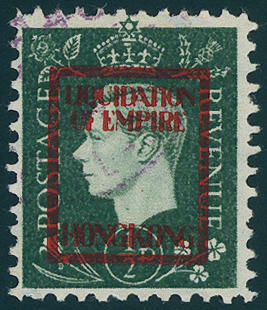 5841 14IIf 3 P. King George VI, German Propaganda forgery for Great Britain, with scarce overprint \"WORLD-SLAVERY\", at the bottom with gutter extension, fresh colors and in perfect condition unused, as issued on ungummed paper. Issued only approximate 30 piece and by Michel fully undervalued! Photo expertize \"the quality is perfect\" Pieles BPP. 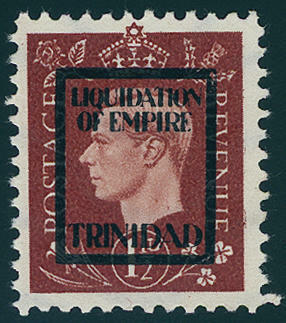 5842 ⊙ 14IVe 3 P. With overprint \"TRINIDAD\", neat cancelled, photo expertize Pieles BPP. 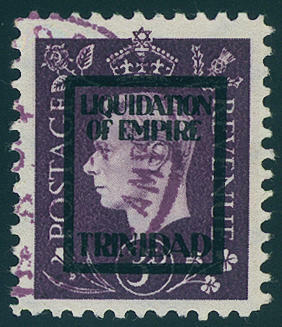 5843 ⊙ 14IVe 3 P. With overprint \"TRINIDAD\", neat cancelled, photo expertize Pieles BPP. 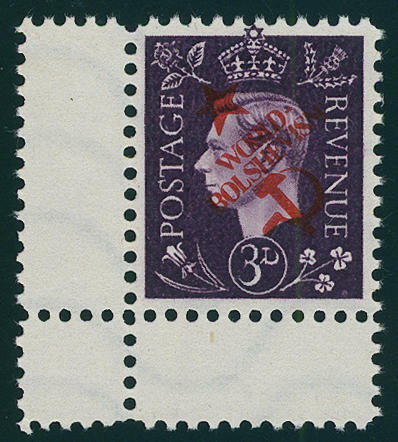 5844 ⊙ 14IVg 3 P. With overprint \"BERMUDA-IS\" from left margin with two-sided gutter extension, neat cancelled, photo expertize Pieles BPP. 5845 15Probe 6 Pfg. Hitler, American forgery for Germany, spectacular proof in black on ungummed reddish brown cardboard paper unperforated with two-sided wide margin. One of the great rarities of this area. There are very few examples have become known. In the Michel special catalogue up to now unknown! Expertized Ludin, photo expertize \"the quality is perfect\" Pieles BPP. 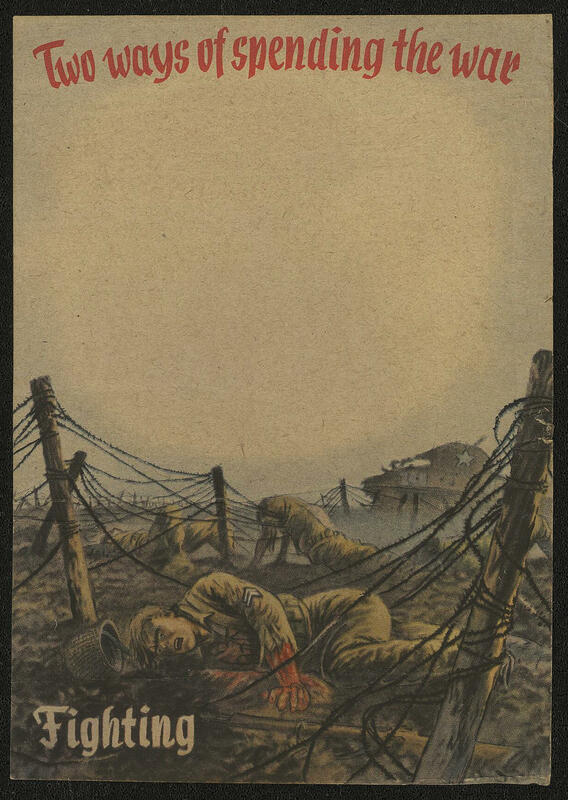 5846 ✉ German propaganda card \"Stop against the light\", published by of the German government for advancing US militaries the so-called \"SIEGFRIED line\" with inscription \"TWO WAYS OF SPENDING THE was\", as usual manufactured restrictions. It is a matter herewith about the no. 1 the set \"THE RICH MAN´S was, POOR MAN´S FIGHT\". Photo expertize Pieles.